SOUTHERN CALIFORNIA–The AF3IRM chapters of Orange County and South Bay will be co-hosting the 2016 Summer School for Women’s Activism (SSoWA) in southern California. On four consecutive Saturdays, the school will be held from 9am to 12pm, with the first two in Carson and the last two sessions in Santa Ana. We invite you to join us in the reclaiming of our knowledge, challenge mainstream education and contributing to a collaborative vision for our collective liberations. Since 2011, AF3IRM Summer School for Women’s Activism has been held annually across the nation from New York to Iowa and across California. AF3IRM’s Summer School for Women’s Activism has led previous courses and discussions on Militarism, Police Brutality in our Communities and Imperialism, Capitalism and Eco-Feminism among others. AF3IRM provides a safe space to build women’s-identities as transnational women on the local level in our communities and to acknowledge our common struggles across the nation. It is a space for the women-identified where we continue to engage, develop sisterhood and create our collective vision of liberation. Although our sisters may reside in different cities and have their own individual experiences, we understand we are connected and ultimately our oppressors and systems of oppressions are mirrored and linked. This is why this year, we are collectively sharing our stories in both the South Bay and Orange County. We have come together to support and to make these connections. 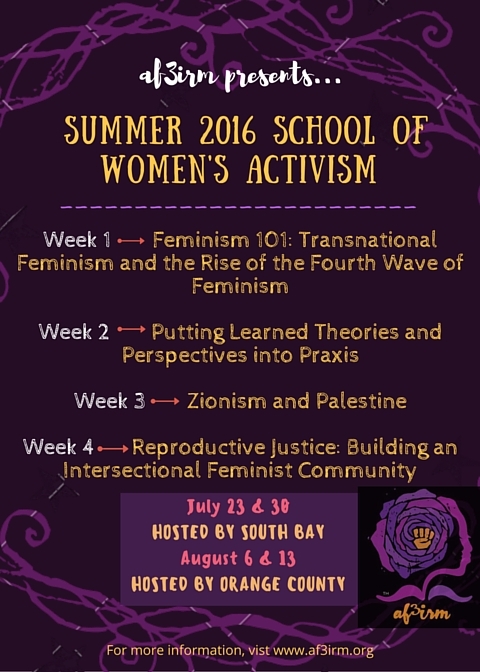 Over the course of 4 Saturdays, AF3IRM South Bay and Orange County will facilitate courses and discussions on Feminism 101, Transnational Feminism: Theory to Praxis, Reproductive Justice & Transformative Justice, and Palestine & Zionism. On July 23rd and 30th, SSoWA will be held at the USW Local 675 Hall at 1200 E. 220th St. Carson CA 90745 and from August 6th and 13th it will be held at TIYYA, 505 N. Tustin Ave. #280 Santa Ana, CA 92705. Join us or sponsor a youth woman, student or mama to join the Summer School for Women’s Activism! All fees are a donation for the grass-roots community organizing of local chapters of AF3IRM. The registration fee or scholarship donations are tax deductible if a check is written to: “AJ Muste Foundation” please contact Angel at [email protected], with any questions. AF3IRM is a transnational feminist, anti-imperialist organization with chapters across the country. Our work has focused on issues of trafficking, migration, and militarism through direct action, advocacy, and education for over twenty-five years. Previous PostAF3IRM OC Podcast: “Mujeres de Las Maquiladoras”Next PostAF3IRM Condemns Oakland’s Predatory Police, Demands Accountability and the Resignation of Pimp-Protector Libby Schaaf!